"Why is there a hog in your motel room?" The first trailer has debuted for a film called Mr. Pig, or Sr. 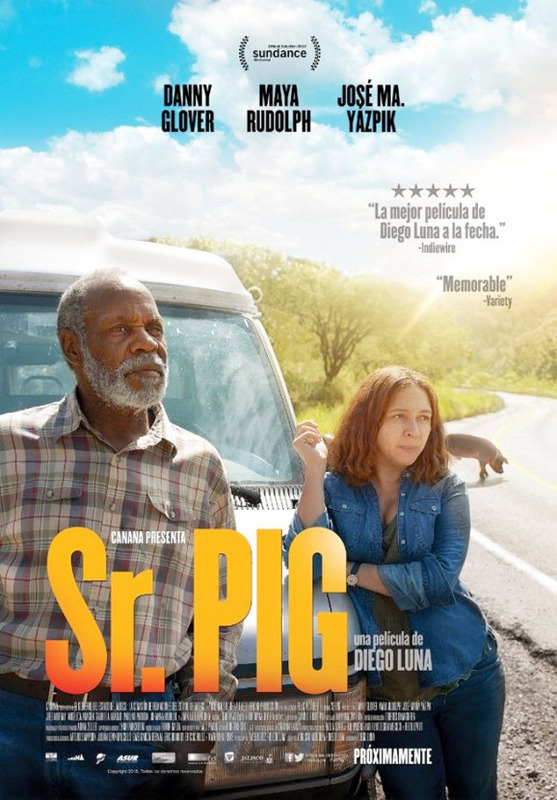 Pig in Spanish, starring Danny Glover as an "old school" pig farmer who goes on a road trip down to Mexico along with a very large pig. This actually originally premiered at the Sundance Film Festival but I don't remember hearing much buzz about it. Mexican actor Diego Luna directs the film (his third feature film), which is described as "a beautiful road movie, and a chance to talk about love for Mexico through the eyes of an American." The cast also includes Maya Rudolph, who co-stars as Glover's estranged daughter who joins him on his trip. I'm not sure what to make of this, it looks charming, but also looks a little dry. Enjoy. Eubanks (Danny Glover), an old-school pig farmer from Georgia on the brink of losing his family farm, sets off on a road trip with Howard, his beloved and very large pig. As they make their way across the border to Mexico to find "Howie" a new home, Eubanks' drinking and deteriorating health begin to take a toll, derailing their plans. His estranged daughter, Eunice (Maya Rudolph), is forced to join them on their adventure. Driven by strong convictions and stubbornness in his old ways, Eubanks attempts to make peace through his devotion to Howie and desire to mend his broken relationships. Mr. Pig is written & directed by Mexican actor/filmmaker Diego Luna, his third feature he has directed after Abel and Cesar Chavez previously. The film premiered at the Sundance Film Festival this year. No US release date is set yet. Glover sounds great! I was a bit worried about from some of his more recent roles, but his speech is so much better. Hmm, this actually looks pretty good. And Maya Rudolph looks good here too. Not really a fan of her comedy but she looks decent here in a dramatic role, IMO.